$27.99 Thunder Group 1008TW Imperial White Melamine Plate 7-7/8"
A great addition to any Asian-themed restaurant or catered event, the Thunder Group 1008TR Longevity Melamine Plate 7-7/8" is perfect for serving breakfast, lunch, or dinner. 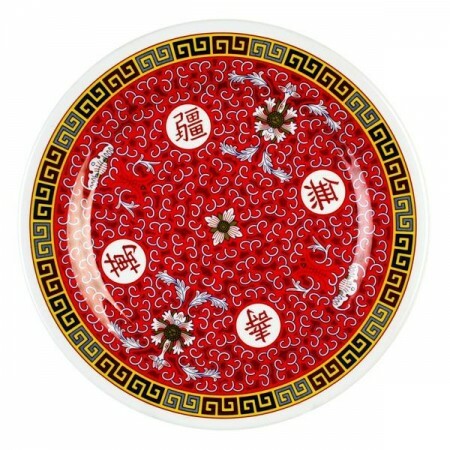 Designed to showcase your specialty dishes, this plate boasts a red oriental motif and yellow border set on a pristine white background. As beautiful as it is durable, this round plate resembles the look of delicate china but with the exceptional durability of melamine. Perfect for high-volume settings, this plate is break resistant and dishwasher safe.